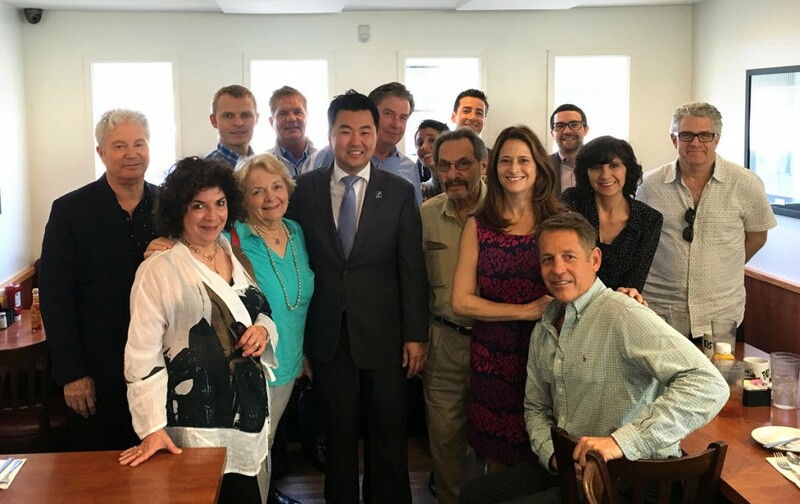 Los Angeles Councilmember David Ryu, along with several of his staff, recently met with Toluca Lake community leaders at Patys Restaurant for an open forum discussing Toluca Lake, one of the communities in the jurisdiction of Council District 4. Toluca Lake was well represented with leaders from the Homeowners Association, Neighborhood Council, Garden Club, Lake Association, Chamber of Commerce, along with several business owners. Ryu serves, and will most likely be the first of many to follow. Councilmember Ryu heard concerns relating to parking, traffic, public safety, homelessness, as well as being apprised of some of the beautification efforts that are in progress. Conversely, Councilmember Ryu and his staff enlightened the group as to some of the efforts the City is making that will positively impact the local community, along with the City of Los Angeles overall. some of the motorhomes we see camping on the local streets. Another issue discussed was the “Mansionization” we see springing up in many of the Valley communities. Councilmember Ryu has been working to close some of the loopholes that exist in the Mansionization Ordinance. It is the resounding sentiment of many local residents to preserve the village feel of Toluca Lake, something that guides the community leaders in their decision-making. It will only be through the concerted efforts of the local residents, community leaders and elected officials working in unison to preserve Toluca Lake not only as our forefathers envisioned, but moving into the future in an everevolving City. According to Ryu, he ran on a platform of improved transparency, and an effort to cut the “red tape” of City Hall for more expedient results, and is working hard to abide by those campaign promises. This meeting was a stride in the right direction!